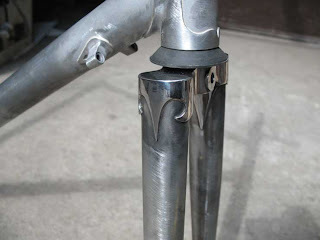 Here’s a couple of pictures of Frank’s stainless steel fork crown after polishing. The pictures don’t really capture the shine very well. I need to work on my photo skills. 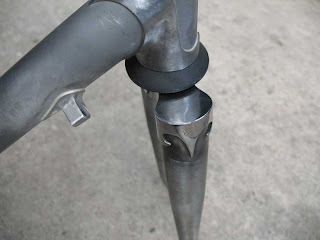 The other two are photos of his fillet brazed stem. 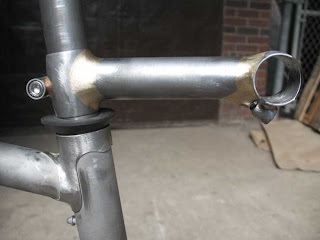 The stem will be painted to match the frame. 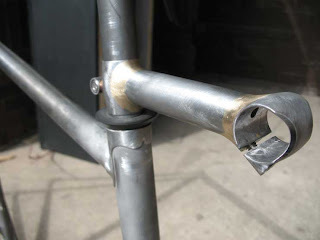 I’m taking this frame and stem along with Pete and Tom’s frames and forks to a frame painting class this next week at Doug Fattic’s shop. Doug is an excellant builder, painter and teacher. The class will shorten my learning curve a great deal. I’m very excited. I won’t be in the shop from March 15-23 and I doubt I’ll access the internet until I return.